Powerchairs designed specifically for children help kids with severely reduced mobility achieve a high degree of independence. Powerchairs are available with a range of special features, including tilt in space for comfort and postural management; seat lift to enable face-to-face communication with standing peers; specialist seating for pressure and posture care. For children who can weight-bear sufficiently, but are unable to walk independently, an extra-supportive wheeled walking frame, such as the one shown here, can be used either as a means of training to walk unsupported, to improve gait, or simply as a means of moving around independently. For younger children, a well designed buggy with a range of frame sizes and seating options, offers stability, comfort and easy manoeuvrability. The one shown here has a dynamic, ultra-lightweight frame with suspension, reducing jolting and allowing a more comfortable ride. 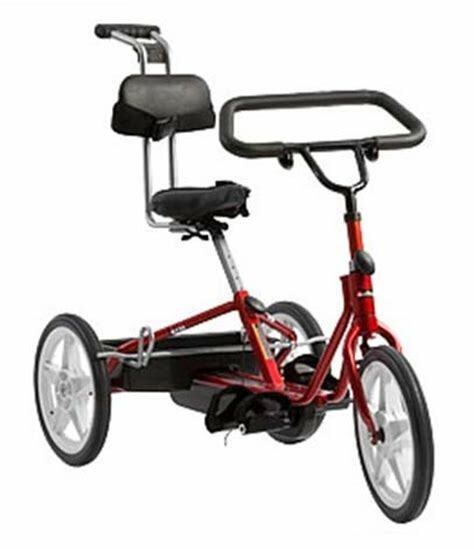 An adapted trike with additional trunk support, can help some disabled children who would otherwise miss out on the fun and independence of cycling. Children who use wheelchairs usually fall into two categories - those who use them for a short time, for instance, kids who broke a leg or had surgery, and those who use them for a long time, or permanently. Even though children who use a wheelchair for a short time may feel frustrated about relying on others to get around, they know that someday the wheelchair won't be necessary. For those children who depend on a wheelchair for the long term, life is different. They'll need to learn how to use the wheelchair in lots of different situations — at home, in school, whilst on holiday etc.. In some cases, it will be hard to use the wheelchair or it might take a long time. People who use wheelchairs can shop, work, go to school, play, drive cars and even compete in some special types of sports competitions. But they also must look for handicapped-accessible buildings, special ramps, parking places, and environments that are wheelchair-friendly. Today's wheelchairs are lightweight, fast and easy to use and include safety features including automatic brakes and anti-tipping mechanisms. Local authorities provide wheelchairs as part of their duty to help disabled children access education. As well as providing children with wheelchairs, local authorities are also responsible for carrying out home adaptations if you need to use a wheelchair at home. Usually you will need a referral to your local authority's wheelchair services to be assessed for a wheelchair. The referral can be from your GP, Occupational Therapist, Physiotherapist or hospital doctor. Wheelchair services will decide if your child is eligible for an NHS wheelchair, and of so, what type. If you are eligible then you will usually be shown various types of wheelchair before the most suitable one is selected for your child. Some NHS wheelchair services offer a voucher scheme to widen your choice of wheelchair. You receive a voucher for the value of the chair you would have been offered after your assessment that you can put towards the cost of a chair bought privately or in partnership with the NHS. There are a number of charitable organisations that loan wheelchairs out on a short-term basis, including The Red Cross. If your local NHS Wheelchair Service does not provide the equipment required to meet your child's mobility needs, “Whizz Kids” may be able to help. You can apply to Whizz Kids for funding for a wide variety of mobility aids. Do you have a child who uses a wheelchair or other mobility aid? Please tell us about your experiences so that we can share them with our readers.